(Stanford, 2010) i-viii + 480 pp. Reviewed by Colleen Glenney Boggs on 2010-05-24. This book traces the cultural history of the American romance with la vie bohème, from the time of its first importation from France in the late 1850s to its burgeoning in Greenwich Village during the 1920s. 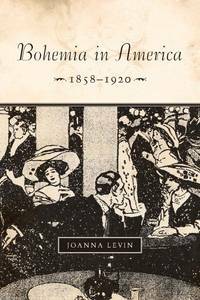 Taking a cultural studies approach, Levin amasses an extensive and impressively researched archive of American Bohemia. Demonstrating how such "major" authors as Walt Whitman, Willa Cather and Theodore Dreiser envisioned Bohemia, she also connects them to a vast number of "minor" authors, popular genres and cultural trivia to develop her central claims. She pursues two aims: one, to demonstrate that a large and important archive of cultural material places Bohemia at the core of nineteenth century American literature and culture, and two, to connect that archive to more familiar territories of American literary studies and reshape them in the process. Levin makes admirable attempts in both areas, but she ultimately succeeds more in achieving the first than the second goal: while she establishes the salience of Bohemia in nineteenth-century American culture, she does not so persuasively link it to the different historical and theoretical concerns that touch upon it. This problem partly springs from the book's own scope and ambition. Because Bohemia is everything and everywhere, the concept at times rings hollow and fails to gain traction. Though Levin acknowledges this hollowness and explores this lack of traction, her book sometimes falls victim to its object and modes of analysis. Chronologically organized, the book charts Bohemia's different geographies, from the origins of an American Bohemia in antebellum New York to the postbellum West and back again to 1920s Greenwich Village. That structure supports one of the book's key arguments: although Bohemia is a floating signifier, it is also repeatedly and significantly grounded. Bohemia functions as a heterotopia, a term that Michel Foucault coined to refer to "counter-sites, a kind of effectively enacted utopia in which the real sites, all the other real sites that can be found within the culture, are simultaneously represented, contested, and inverted." Bohemia takes on local definitions, even when those local definitions defy the very concept of the local, as they do in the opening chapter. As a term, Bohemia and the concept of the Bohemian life are imported from France at mid-century, when the term starts doing cultural work that is far from consistent. Operating at the intersection between imagination and geography, Bohemia served as an important lens through which nineteenth century Americans saw and negotiated differences of class, gender, and race. The discussion of class is particularly interesting and layered: the book suggests early on that Bohemian is the opposite of bourgeois, yet the two are mutually constitutive (5). In that sense, Bohemia functions as a counter-culture that simultaneously participates in and stands apart from other elements of American culture. The first chapter draws on an unfinished poem, Walt Whitman's "The Vault at Pfaff's," to introduce several of the book's most important strands of analysis. Since the poem refers to the restaurant and beer salon on Broadway where the self-proclaimed Bohemians met, Levin unfolds the significance of the scene (on which see also The Vault at Pfaff's). Treating the community assembled there as the nucleus for Bohemia's dispersal to Western locales, she traces the lives of the participants in other chapters and links other manifestations of Bohemia back to this inaugural cultural moment. The results are mixed. While Levin's readings of Whitman's poem shed light on the cultural significance of Pfaff's, she is less convincing in her attempt to reread Whitman through the lens of Bohemianism. We are told, for instance, that in the frontispiece to the 1855 Leaves of Grass, Whitman adopts the pose of a Bohemian. This provocative suggestion challenges the conventional reading of Whitman as a laboring "rough," links his work to a larger cultural archive, and adds a new turn to his self-fashioning. But ultimately, the significance of this insight doesn't become fully clear. Since Bohemianism exemplifies the self-contradictory multiplicity that we already associate with Whitman, it does not offer a new methodology for reading his works. Nevertheless, the book itself performs a Whitmanian reading, so to speak, of Bohemia as a constantly shifting, multiple, contradictory construct, and compellingly traces its disseminations. Often resorting to biography, the book treats Bohemia as a cultural identity that draws on even while confounding our current categories: it is ethnic, racial, gendered, local, national, transnational, geographic, utopian, historical, ahistorical - all and none of these. Perhaps the profoundest challenge and intervention that this book produces lies in its ability to confound the taxonomies on which Americanists rely in their engagement with nineteenth century culture. While much scholarship over the past decades has challenged our cultural epistemologies in productive ways, this book shows how messy the historical past is, and thus unsettles our habit of taxonimizing its conflicting strands. The organization of this book gains a certain kind of strength at the cost of some weakness. In tracing its different strands of analysis - race, gender, ethnicity, class, to name but a few -- through each one of its chapters, the book keeps its chronological trajectory and geographic specificity, and also shows how multiple issues come to bear on each strand of Bohemia. But the cost of this approach is that discussions of any one issue often feel scattered, and that a locally more sustained engagement with them falls by the wayside. The chapters at times seem to rush from one aspect of the archive to another, at the cost of the book's argumentative force. When the first chapter, for example, gives just two pages (40-41) to the role played for Bohemia by immigrants and women, it prompts us to suspect a brisk tagging of categorical bases, such as ethnicity and gender, that one must de rigueur consider in discussions of nineteenth century American culture., It ultimately builds a far more sustained, compelling, and coherent argument about these different categories, documenting in a later chapter, for instance, that Bohemia functioned as a stage in women's education. But its organization might have been more effective if its chapters had focused specifically on topics such as women and immigrants. The specificity of local spaces will be interesting to some readers, but the book's larger audience will be more invested in Levin's scholarly interventions, which get dispersed and buried by the book's organization. Levin's Bohemia, however, is not dispersed to Europe. While readers might expect her to locate it in the Paris of Hemingway and Stein, her title plainly indicates that she aims to document Bohemia in America. Where appropriate, the book considers the American importation of European models of Bohemianism, juxtaposing Whitman with Baudelaire, for instance (52-56), or parsing the Bohemians' relation to the urban spectator and flâneur (75-81), who have an ordering function that the Bohemian rejects. Yet even though it acknowledges the Bohemians' engagement with international scenes, the book itself does not participate in the current scholarly examination of the transatlantic as a nineteenth century heuristic. That's a shame, because the strands of analysis that point in that direction are particularly promising and rich. Levin argues that "a prior nationalism" formed the basis for Bohemian cosmopolitanism: American Bohemians envisioned cosmopolitanism as a strengthening of "national characteristics and not their dissolution" (45). This reading enables Levin to produce a startling account of the "Western tale" as a form of Bohemianism (112), and unfolds the many-layered connections between national and regional cultures by which Bohemia alternately figures as a synonym for America (285) or as the figuration of a specific region (244). But there's a cost to this nationalization of Bohemianism. What about the unsettling of national characteristics that Americans performed, as for instance in the "Anglophilia" that Eliza Tamarkin has recently discussed as an important locus for African-American identity formation? At times, the book sets up straw-figures to create a stability against which it pits its investment in the mobility of cultural categories. Terms like "conventional morality" (38) seem to serve such a purpose, and run counter to the book's own model of multi-layered cultural engagement. In the end, however, this might itself be something we can now recognize as a Bohemian move, that is, the projection of stability onto categories of culture from which one wishes to remove oneself, in a refusal to be bound by restrictions and in an attempt to imagine culture itself as mobility. Colleen Glenney Boggs is Associate Professor of English and Women's and Gender Studies at Dartmouth College. I thank Colleen Glenney Boggs for her thoughtful review of my book and for highlighting its layered approach to American Bohemianism. I would also like to take this opportunity to address a few of her points. As Boggs notes, my analysis of gender issues is somewhat "dispersed" since I trace the relationship between Bohemianism and gender in a series of different cultural contexts. But with respect to another issue that Boggs contends is similarly dispersed in my book--the relationship between immigrant cultures and Bohemianism--the majority of this material is consolidated in chapter 6, "Cosmopolitan Bohemias." Chapter 6 also introduces some of the ways in which Bohemia promoted the "unsettling of national characteristics." Though Boggs suggests that my "nationalization of Bohemianism" overlooks this "unsettling," I do in fact argue that Bohemia challenged various national characteristics and strictures. For example, I analyze representations of the ethnic restaurants in New York City and San Francisco that were characterized as "Bohemian" in contemporary guidebooks and stories. "Within such accounts," I argue, "Bohemia annexes the foreign for the delectation' of the United States. Yet, while providing a quasi-imperial stage for cosmopolitan consumption, Bohemia also constituted a liminal space, a world peculiar to itself' where national boundaries and identities might become less entrenched" (295). Similarly, at the end of chapter 6, I discuss the cosmopolitan space of "black Bohemia." Analyzing the writings of James Weldon Johnson, I argue that Johnson "continued to posit a gap between the racial' and the national,' and it was at this juncture that black Bohemia proved most crucial to his cultural geography" (336). These arguments are developed at length in the chapter, and both complicate the "nationalization of Bohemianism." Finally, I also describe how conceptions of American national identity began to change, so that "national characteristics" would not simply become static "straw-figures" around which Bohemian mobility revolved. I would also like to address Boggs' claim that my "Bohemia ... is not dispersed to Europe." My book does in fact discuss several novels written by such expatriates as Henry James--novels that concern American characters abroad in the Bohemia of the Parisian Latin Quarter and that explore the interplay between the American and the European. Such novels as The Ambassadors, I argue, alternately foreground and destabilize national traits. Thanks again to Colleen Glenney Boggs and NBOL-19 for thoughtfully engaging with my work. Leave a comment on Colleen Glenney Boggs's review.